Erik Swyngedouw at the School of Environment and Development offers us the following intervention into on-going debates over the place of public space in the enactment of politics. A longer version is forthcoming in Political Geography. Tiananmen square, Place de la Bastille, Red Square, Alexanderplatz, Tahrir square, Assaha-al-Khadra, Syntagma Square, Green Square, Wenceslas square: these are just a few of the public spaces that have become engrained in our symbolic universe as emblematic sites of revolutionary geographies. Their names stand as points de capiton that quilt a chain of meaning through signifiers like democracy, revolution, freedom, being-in-common, solidarity, emancipation. The emergence of political space, these examples suggest, unfolds through a political act that stages collectively the presumption of equality and affirms the ability of ‘the people’ to self-manage and organize its affairs. It is an active process of intervention through which (public) space is reconfigured and through which – if successful – a new socio-spatial order is inaugurated. The taking of urban public spaces has indeed always been, from the Athenian ochlos demanding to be part of the polis to the heroic struggle of the Tunisian people, the hallmark of emancipatory geo-political trajectories. There is an uncanny choreographic affinity between recent urban revolts in the Middle East and eruptions of discontent and urban protest in Athens, Madrid, Lyon, Lisbon, Rome, London, Berlin, or Paris, among many other cities. However, although the Middle Eastern uprisings are celebrated by Western media pundits and politicians, their European counterparts are often disavowed as illegitimate outbursts of irrational anger and anarchic violence. 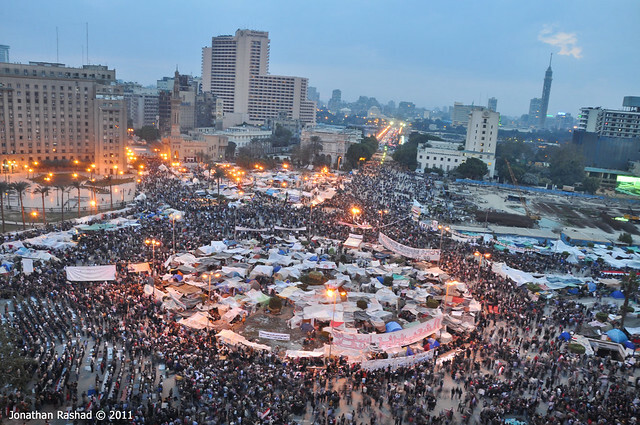 Consider, for example, how a few hundred thousand people acting in common on Tahrir square are staged as the stand-in for The People, for the totality of 81.3 million Egyptians, while the participants in urban insurgencies in the global North are customarily labeled as protesters, rebels, anarchists and, occasionally, as ‘scum’. Particularly when things turn nasty, every effort is made to assure that the ‘rioters’ are not identified with The People. Despite their highly variegated political-economic and socio-cultural embedding, the events in Europe and the Middle East share that they are considered illegitimate, often repressed, and invariably disavowed by the ‘local’ elites. Their participants are not considered to be proper political interlocutors. Sarkozy called the 2005 rioters ‘racaille’,Gaddafi repeated something similar six years later in his repudiation of rebelling Libyans. Yet, these events also share an indisputably ‘political’ character. The contemporary urban condition is marked by a post-political police order of managing the spatial distribution and circulation of things and people within a consensually agreed neo-liberal arrangement. Rancière associates this condition with the notion of ‘The Police’, conceived as a heterogeneous set of technologies and strategies for ordering, distributing, and allocating people, things, and functions to designated places. These managerial practices and procedures colonize and evacuate the proper spaces of the political; the Police are about hierarchy, ordering, and distribution. Spatialized policies (planning, architecture, urban policies, etc…) are one of the core dispositifs of the Police. Politics inaugurate the re-partitioning of the Police logic, the re-ordering of what is visible and audible, registering as voice what was only registered as noise, and re-framing what is regarded as political. It occurs in places not allocated to the exercise of power or the instituted negotiation of recognized differences and interests. As Badiou insists, politics emerge as an event: the singular act of choreographing egalitarian appearance of being-in-common at a distance from the State. Whereas any logic of the Police is a logic of hierarchy, of inequality, politics is marked by the presumption of equality within an aristocratic order that invariable ‘wronged’ this presumption. It is within this aporia between la politique (the Police) and le politique (the political) that urban insurrections can be framed. While much of the State’s attempts to re-order the urban through mobilizing discursively a set of signifiers of inclusiveness (social cohesion, inclusion, emancipation, self-reliance), while reproducing in practice well-worn clichés of urban doom (exclusion, danger, crisis, fear). Attempts to produce ‘cohesive’ cities revolve around choreographing distribution and circulation of activities, things and people such that the police order remains intact. While the state’s statements frame particular trajectories of ‘inclusion’, they shy away from acknowledging division, polemic, dissensus and, above all, from endorsing the assumption of equality on which the democratic political rests. Justice, equality and communality are censored from the script of urban policy prescriptions. It is precisely this suturing process that suspends political litigation, voicing or staging dissent or asserting polemical equality. These cut through the police order and tentatively open up the spaces of the political again. The urban insurgents have no demands; they do not expect anything from the Police. They have no program, no pronunciations; neither leader nor party. Perhaps they are part of something that is called into being through resonance, viral infection and affiliation, not through hierarchy and structure. They do not demand equality, they stage it and, in doing so, produce, pace Balibar, equa-libertarian spaces. This staging of equality and freedom, the interruption of the normalized geographical order of the sensible, exposes the aristocratic configuration and in-egalitarian ‘wrongs’ of the given, and invariably encounters the Police’s wrath. Such exposition of equa-liberty cannot remain unnoticed: it either succeeds or meets with violence, the terror of the State that – in its violent acting – precisely affirms that some people are not part of The People, that the police order is indeed in-egalitarian. This constitutive gap between Police and Politics needs to be affirmed. Politics cannot be reduced to managing and ordering space, to consensual pluralist and institutionalized policy-making. This is the terrain of the Police; the ontic dimension of everyday socio-spatial management. The political – as the staging of equality in the face of a wrong – is nothing else but the affirmation of impossibility of consensual management, of autocratic rule; it is an anarchic interruption that affirms the foundation of the democratic invention, i.e. the equality of each and every one qua speaking beings – a condition that is predicated upon affirming difference and the dissensual foundation of politics. This notion of politics centers on division, conflict, and polemic. Politics appears as a practice of re-organizing space under the aegis of equality; it emerges where it is not supposed to be, in public space. Such political events are interventions that transgress the symbolic order and mark a shift to a new situation that can no longer be thought of in terms of the old symbolic framings. Proper politics is thus about enunciating demands that lie beyond the symbolic order of the Police; demands that cannot be symbolized within its frame of reference and, therefore, would necessitate a transformation in and of the Police to permit symbolization to occur. Therefore, the political act is, as Žižek argues, “not simply something that works well within the framework of existing relations, but something that changes the very framework that determines how things work …. it changes the very parameters of what is considered ‘possible’ in the existing constellation”. This constitutes a proper political sequence; one that can be thought and practiced irrespective of any substantive social theorization. It is the political in itself at work. Such new symbolizations are where a possible re-politicization of public civic space resides. These symbolizations should start from the premise that the presumption of equality on which democracy rests is ‘wronged’ by an oligarchic police order. It emerges where those who are un-counted and unnamed, whose fantasies are only registered as noise, produce their metaphorical and material space. Such claim to the Polis is what links the urban protests in the Middle East and the Global North. It signals the ability of The People to take hold of their future. This entry was posted in Interventions and tagged Politics, Public Space on March 18, 2011 by citiesmcr.